Students with an engineering or science background and an interest in microsystems engineering and bioprinting are encouraged to join me at the University of Melbourne. 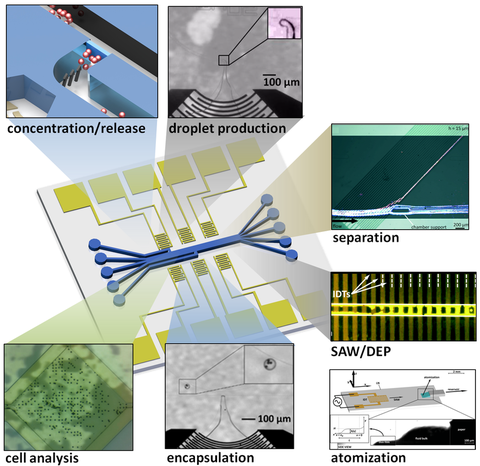 Microfluidic devices are used in a variety of research, industrial and therapeutic applications. These devices take advantage of the physics at small length scales, where surface tension and interfacial effects dominate over more familiar forces, such as gravity. Most importantly, by creating physical structures or force fields (electrical, magnetic or acoustic) with dimensions on the order of microns, individual cells and particles can be manipulated and analysed for rapid and low-volume cell studies and diagnostics.